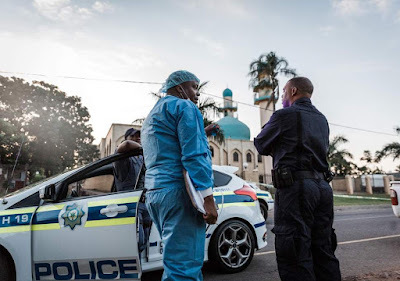 South African police say two worshipers have been stabbed to death in an attack on a mosque in Malmesbury, Western Cape. The suspect, who was armed with a knife, was shot dead by police outside the mosque. Three others, including a police officer, were injured during the incident. The Muslim Judicial Council said in a statement that it was "shocked to its core to learn of a brutal attack on the Malmesbury Masjied in Cape Town in the early hours of this morning". The two people killed were in I'tikaaf meaning they had been sleeping in the mosque for a period of days as an act of devotion. The attacker was not known to the mosque community, a spokeswoman for the Council said. Western Cape police spokesman Lieutenant Colonel Andrè Traut said the suspect, "believed to be in his thirties and armed with a knife, was still on the scene and charged at the police who tried to persuade him to hand himself over". "He ignored the calls and tried to attack police. He was shot and killed in the process," Mr Traut said. The attack comes a month after another assault on a mosque in Verulam, north of Durban. In that attack, three men stormed the place of worship, killing one and injuring others. They then fled the scene, and no arrests have yet been made. Speaking to eNCA, Mishka Daries of the Muslim Judicial Council described the attack as "brutal", saying it was a "shocking and sad assault on what is probably the last day of Ramadan". Asked if she feared a spike in such incidents, Ms Daries said she “understood these concerns within the Muslim community”. "We are still trying to come to terms with [the attack]," she said. "A mosque, a church, a synagogue, any house of worship - they are sacred places… you feel safe, you feel secure, you know that this is your time with God and that is your focus. Unfortunately it seems this isn’t the case. "We would like to call for calm in the community,” she added, urging people not to “retaliate in any form” while the facts surrounding the attack remain unclear.